little momma and company: what I have to show for my weekend. Its been a while since I have been crafty lately. The move from Texas to Utah set me back a lot! Even before the move I found it hard to be creative since we had to keep our current house spotless while we were trying to sell it. I couldn't have snippets of cloth, stray threads, or paper bits on the carpet. 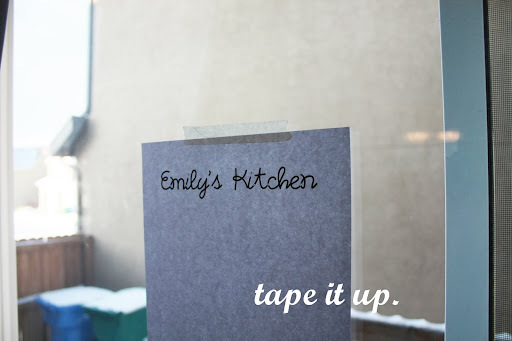 I am in the process of making my kitchen feel like my own. My old kitchen had me written all over it, this one is still foreign to me. 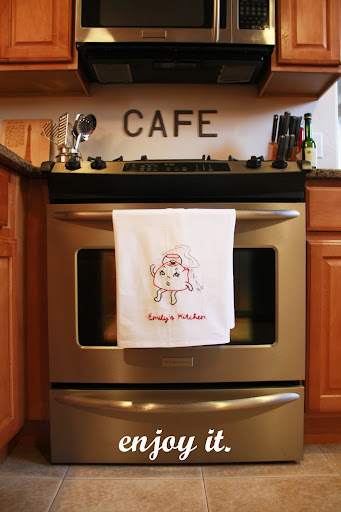 So, I decided to make an personalized embroidered dish towel to hang on my oven and bring a little bit more of me to my new kitchen. 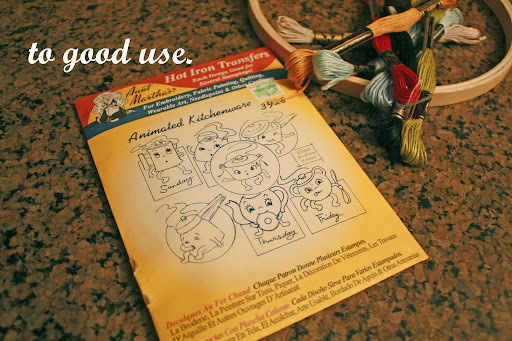 Hot iron transfers are so much fun to use... of course you don't have to. 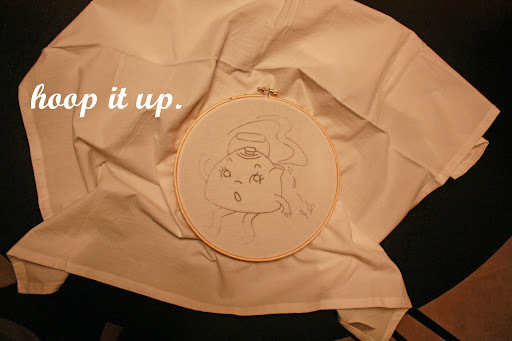 I've embroidered many things that I have hand drawn onto my blank canvas. But, this weekend... I wanted a lazy project. And, I love the vintage animated kitchenwear iron ons that I found at Hobby Lobby. 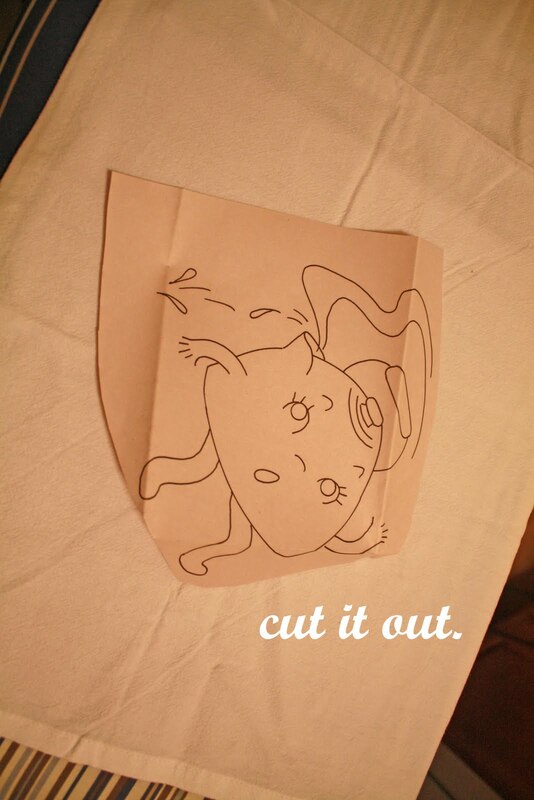 Who can resist their kitchy appeal, winky eyes, and retro cuteness. I don't think I could have drawn one better myself. 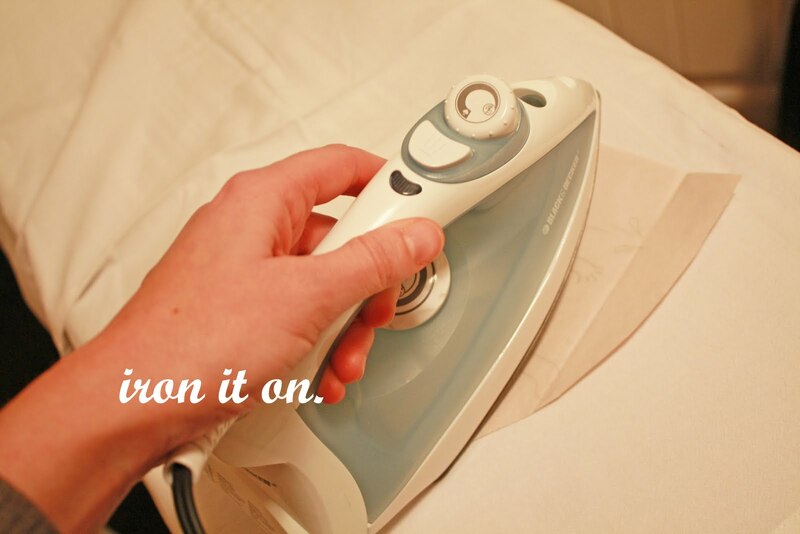 When you iron it on, make sure you don't use any water. You don't want the paper to fall apart. ALSO (and I learned this from experience!) Put a small dishrag or old towel under the surface your are ironing on will keep the transfer from leaking through the fabric and onto your ironing board. No husband wants prints of vintage dishes on their crisp, white church shirts! Trust me on this one! I lost my embroidery hoop in the move, it was so cute... canary yellow - vintage-ness. So, I had to pick one up at the craft shop... but it was only $0.99! I am still holding out for my old one somewhere, maybe I missed unpacking a box? 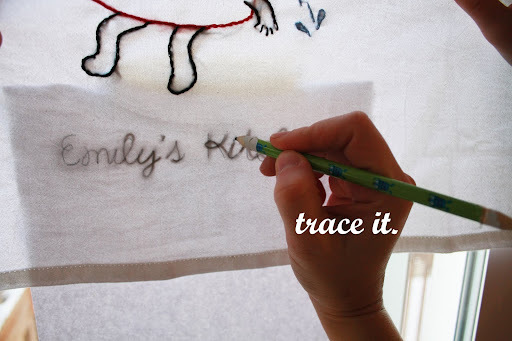 The trick to embroidery is all in the stitch. If you have never done it before, it's simple... trust me. I use what is called the split stitch, basically I stitch over the stitch I just made. 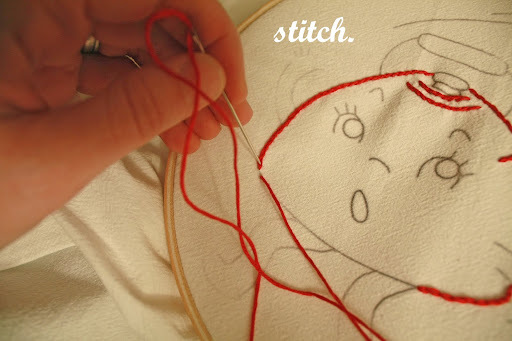 For a more complete how to, you can click here to the Sublime Stitches site. It's my favorite place to get patterns. 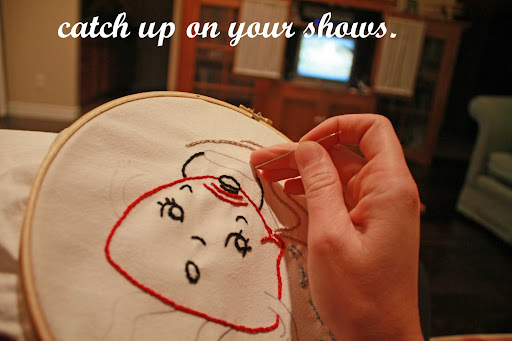 The thing I love about embroidery is, once you know how... it is so relaxing! 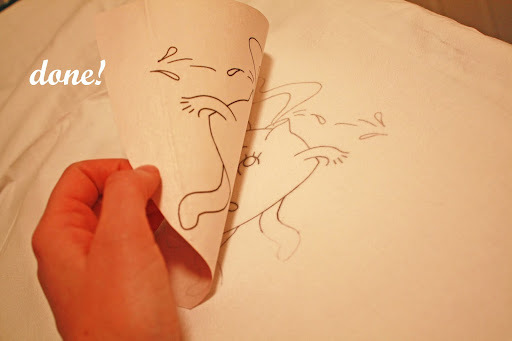 And even though you are using iron on transfers, that does not mean that you can't personalize your creation! I wanted the words "Emily's Kitchen" on my towel. Now, if I had a light box, I would whip that out at this point-- which would be so amazingly awesome. But I don't. 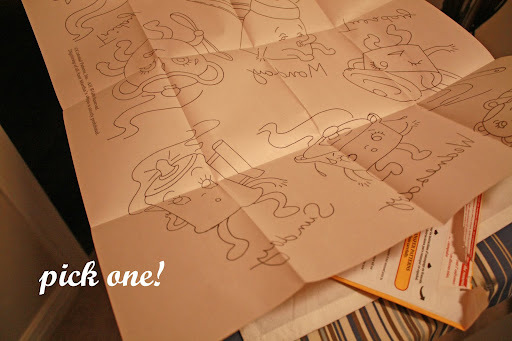 After you trace it, stitch it up and you are left with a personalized treasure! Oh my! How darling! Absolutely love it! I love this! I need to get my needles and thread out! Sounds like a good activity to do while catching up in my Gossip Girl! This was so cute. My mom used to have a whole drawer full of iron-patterns. Love the vintage look of these. Reminds me of her drawer. Oh my! 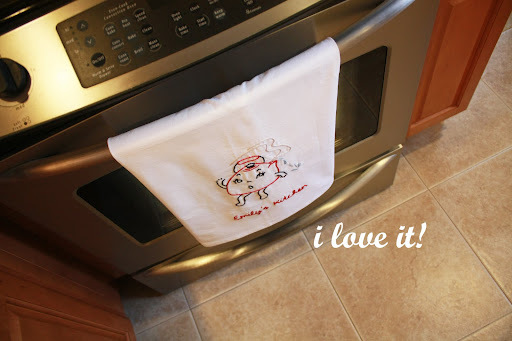 Your embroidered kitchen towel is just the cutest one I've seen! Now if I could only make myself be that patient. Adorable! I have some tea towels that I picked up at the dollar store, but hadn't found a use for them yet... I might give this a try! Oh!! I need to look for towels at the 1$ store, great idea!! the sledding hill, and the best deal in town. rainy day at the Bean. snow, snow, friend or foe? i'm sick, so you get curtains. the road to Chicago deep dish pizza. Soooo.... we moved to Utah.